As we home in on the final months of the season, it’s clear that this NBA campaign has been one of sheer unpredictability. Perhaps not at the top of either the Western or Eastern conferences, but certainly elsewhere. The trade deadline saw one of the biggest moves in recent memory, while other teams reinforced smartly ahead of the play-offs. It’s bewildering how far the Celtics have come in such a short period of time. 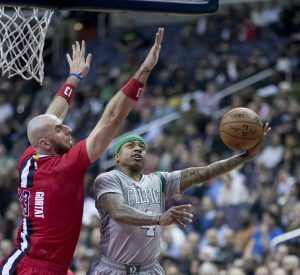 At the start of the season, they were struggling to find consistency with Isaiah Thomas’ brilliance being tossed away by under-performing team-mates. At this point, the Celtics are the best team in the NBA, not just a surprise package. They are the only team that can step to the Cleveland Cavaliers in both the regular season, and the play-offs. They have offered the Eastern Conference, as well as neutrals, the hope of an upset in the road to the Finals. Thomas’ electrifying form is infectious, and has clearly spread to those around him. Jae Crowder looks a man possessed, while Jaylen Brown is making a case for being one of the standout performers in his age-bracket. Coach Brad Stevens has yet to manage a play-off game, so it will be interesting to see how his youthfulness and hunger translates to the biggest stage. As of right now, his progression has been impeccable. Not only has he got the Celtics in 2nd place, two wins behind the Cavs, but he already has an All-Star game under his belt. GM Danny Ainge’s reluctance to make a trade at the deadline could hurt this team in the play-offs, especially since their interior defence is non-existent. But the percentages they are currently shooting at could see them blow out any team on any given day. One has to wonder if copy and pasting part two of this quarterly report would suffice in this section. But, somehow, the Nets have worsened. Not only did they make no significant push at the trade deadline, they allowed 3-point shooting maverick Bojan Bogdanovic to move to Washington for next-to-nothing. Without a shooting presence, and an underperforming Jeremy Lin and Brook Lopez, the Nets look nailed on for one of the worst NBA season records of all-time. They were 8-33 when the previous report was written. 21 games later, they have only won two more. And only three of their wins have come in their own conference. The Nets look a dishevelled franchise. Broken, unfixable and unwatchable. New York has become devoid of any team worth shouting over. Not only are the Wizards the most improved team, they’re undoubtedly the most entertaining. A backcourt comprised of John Wall and Bradley Beal has become one of the most talked about partnerships this season. Electrifying and productive in the clutch, these two have a genuine chance at making the conference finals this year. They’re third in the conference, boasting 17 wins in their last 23 games. In the first quarterly report, we had them down as one of the most disappointing teams. Right now, they look unstoppable. 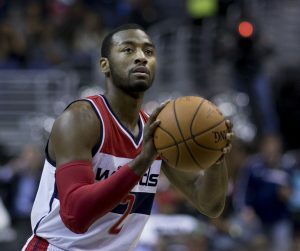 Whether that be going toe-to-toe with the Warriors and beating them, or taking the Cavs to overtime, the Wizards look like the real deal. Wall is posting up career highs in points, assists and 3pt percentages. Likewise, Beal. Around them is a team made up of hot shooters and workhorses. Otto Porter Jr. has the best 3pt shooting percentages in the entire league – yes, higher than Steph Curry and James Harden. Kelly Oubre Jr. looks to be developing into a future star of this league, meanwhile Markief Morris is doing all the dirty work at both ends. With the smart acquisition of Bogdanovic at the deadline, the Wizards have become even more of a sharpshooting team. This could be the key to any play-off upset. Nikola Jokic has gone from the typical brutish European centre to a player of immense, unplayable quality. He’s posted up multiple triple-doubles in the last 20 games, driving the Denver Nuggets from mediocrity to a near-lock for that 8th place play-off position. He’s one of the league leaders in assists, and one of the most proficient passers around. A playmaking maverick, a rebounding machine and a point-hoarder, Jokic is utterly phenomenal. Despite his bulk and height, he moves elegantly and to a level that we have never seen in the NBA. If there’s one player who deserves this award at the end of the season, it’s Jokic. From complete unknown to one of the hottest names around. I wanted to avoid the blockbuster move as much as I could, since I feel as though Serge Ibaka and PJ Tucker to the Toronto Raptors is the move that most improves a team and equips them best for a play-off push. But it’s DeMarcus Cousins. 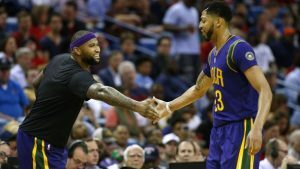 Moving away from the team where he’s spent his entire career and joining former college team-mate Anthony Davis. This move was mind-blowing for the NBA. Not only do the Pelicans now have the two best big-men in the league, they undoubtedly have all the potential in the world to bring a ring to New Orleans. Rebounding has long been an issue for Championship winners in the past; with the Warriors for example it’s been their Achilles heel this year. The Rockets have the same problem; the Cavs sometimes struggle… the list goes on. The Pelicans not only succeed in that area, they thrive and feed off it. Second-chance points are their best friend. If they can sneak into the play-offs this year, expect this blockbuster trade to upset the biggest of teams. If not, they’re set to be the most anticipated team to watch for next season. If they can acquire the right pieces to place around this titanic, unplayable frontcourt, they’re legitimate contenders next season. The Miami Heat traded off Dwayne Wade in the summer, effectively leaving their team devoid of star quality. But the players who were nothing more than good, have now become great. After a shoddy start to the season, where they were rooted to the bottom of the conference for 30 straight games, the Heat are now one win from a play-off spot. How they achieved such a feat is tough to explain. They registered a 13-game win streak – the longest we’ve seen this season from any team – including victories over the Warriors, Rockets and Cavaliers. With the hustle, rebounding and blocking of Hassan Whiteside, the Heat are always a scrappy team to play against. They’re physical and rough, with emphasis placed on bullying opposition teams off the court. But, beyond that physicality, is a gorgeous style of play within their ball movement. 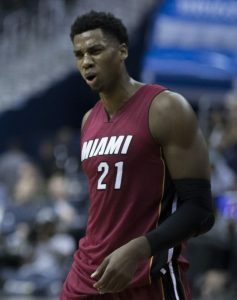 Players like Goran Dragic and Dion Waiters are facilitators of the highest order, creating space on the court, knocking down 3’s from improbable range and finding Whiteside in the paint for easy points. This trio have brutalised opposition and dragged the Heat from misery to magnificence. It will be interesting to see how this young, untested team can cope in the play-offs, if they make it.